Tri-Village Power Lifting team participated in the Ohio High School State PowerLifting Meet in Divisions V, VI and VII. 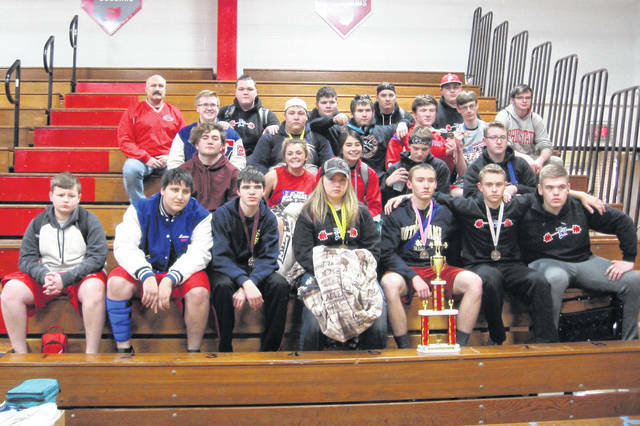 KENTON – The Tri-Village Power Lifting Team participated in the Ohio High School State PowerLifting Meet in Divisions V, VI and VII held at Kenton High School, Saturday, March 16. Thirty schools were represented from across the state with 21-Tri-Village boys and three girls participating with nine receiving awards including top 12 for boys and top six for girls. The boys team finished fifth in the team competition while the girls finished in eighth place. Wyatt Plush finished fourth in the boys heavyweight division lifting a total of 1,255 pounds with 255 in the bench press, 500 in the dead lift and 500 in the squat. Lauren Banis placed fourth in the girls 195 pound class with a total of 600 pounds with 115 in the bench, 255 in the dead lift and 230 in the squat. Foster Brown finished fifth in the boys 155 pound division by lifting 805 pounds with 165 in the bench press, 340 in the deadlift and 300 in the squat. Elias McDaniel placed eighth in the boys 125 pound division as he lifted 500 pounds with 110 in the bench press, 235 in the dead lift and 155 in the squat. Isabella Rameriz finished eighth in in the 135 pound class with a total of 485 pounds lifting 80 in the bench, 235 in the dead lift and 170 in the squat. Dylan Holsapple finished eighth in the boys 195 pound weight class by lifting 895 pounds with 205 in the bench press, 375 in the dead lift and 315 in the squat. Jadyn Hickman finished 10th in the girls 135 pound division with as she lifted 475 pounds with 90 in the bench, 235 in the dead lift and 150 in the squat. Blake Brandenburg placed 11th in the boys 145 pound division lifting a total of 675 pounds with 165 in the bench press, 270 in the dead lift and 240 in the squat. Christian Cantrell finished 11th in the boys 210 pound weight class by lifting 850 pounds with 180 in the bench press, 330 in the dead lift and 340 in the squat. William White finished 12th in the boys 135 pound class with a total of 620 pounds, 120 in the bench, 275 in the dead lift and 225 in the squat. James Penny placed 12th in the boys 185 pound division as he lifted 685 pounds with 165 in the bench, 295 in the dead lift and 225 in the squat. Dalton Barga finished 13th in the boys 195 pound class lifting a total of 735 pounds with 135 in the bench, 375 in the dead lift and 240 in the squat. Brian Johnson finish in 13th place in the boys 210 pound division with a total of 780 pound lifting 155 in the bench, 390 in the dead lift and 235 in the squat. Collin Marshall placed 14th in the boys 135 pound class with a total of 545 pounds with 135 in the bench, 260 in the dead lift and 150 in the squat. Ashdon Dyson finished 16th in the boys 175 class with a total of 495 pounds with 75 in the bench, 235 in the dead lift and 185 in the squat. Willie Strunk placed 16th in the boys 225 pound class lifting a total of 745 pounds with 175 in the bench, 330 in the dead lift and 240 in the squat. J. Necessary finished 16th in the boys 250 pound class with a total of 980 pounds with 225 in the bench, 440 in the dead lift and 315 in the squat. Nick Varvel finished 18th in the boys 225 pound division with a total of 710 pounds with 160 in the bench, 310 in the dead lift and 240 in the squat. Chance Davis placed 18th in the boys 250 pound class lifting a total of 880 pounds with 210 in the bench, 380 in the dead lift and 290 in the squat. Tyler Bragg finished 18th in the boys heavyweight division with a total of 945 pounds lifting 215 in the bench, 400 in the dead lift and 330 in the squat. Hunter Gillett placed 19th in the boys 225 pound class with a total of 645 pounds with 0 in the bench, 365 in the dead lift and 280 in the squat. Elijah Driver finished 20th in the boys 250 pound division with a total of 850 pounds with 160 in the bench, 375 in the dead lift and 315 in the squat. Seth Jesse placed 21st in the boys 225 pound division with a total of 285 pounds with 90 in the bench, 0 in the dead lift and 195 in the squat. Blake Weyant finished 22nd in the boys heavyweight division with a total of 760 pounds with 155 in the bench, 310 in the dead lift and 295 in the squat. The Tri-Village boys team lifted a total of 9,520 pounds good for fifth place while the girls totaled 1,560 pounds to take eighth place. This entry was tagged New Madison, Powerlifting, Tri-Village. Bookmark the permalink.